What powers the 2017 Jeep Renegade? The Renegade is available with a 1.4L MultiAir Turbo engine or a 2.4 L Tigershark MultiAir 2 engine. 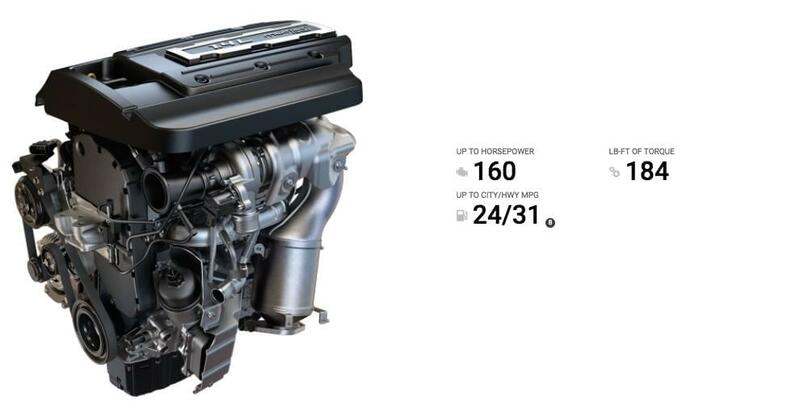 Both engines offer outstanding efficiency and responsive power for a refined driving experience. From rural roads to the most modern highways, the Jeep Renegade is designed to give you impressive ride and handling. A stiff body structure, constructed of approximately 70% high-strength steel, magnesium and aluminum, combined with a responsive steering system and an integrated KONI frequency selective damping front and rear strut system all add up to the premium performance. In combination with premium performance, Jeep Renegade offers an available nine-speed automatic transmission. Every Renegade equipped with the available 2.4L Tigershark MultiAir 2 engine benefits from this transmission. The wider gear selection brings outstanding launch characteristics, remarkable efficiency and virtually unnoticeable shifts between gears. Talk about versatility. Furthermore, the capable Jeep Renegade can tow up to 2,000 pounds with the available 2.4L Tigershark MultiAir 2 engine so you can tow all kinds of gear. This tow rating is useful for hauling everything from folding camp trailers to trailers for small boats, motorcycles and snowmobiles. The 1.4L MultiAir Turbo is powerful with a fuel-efficient engine that takes full advantage of our advanced MultiAir technology. The system varies the volume of air consumed by the engine, resulting in superior performance and strong pulling power. It’s standard on the Sport and Latitude models. 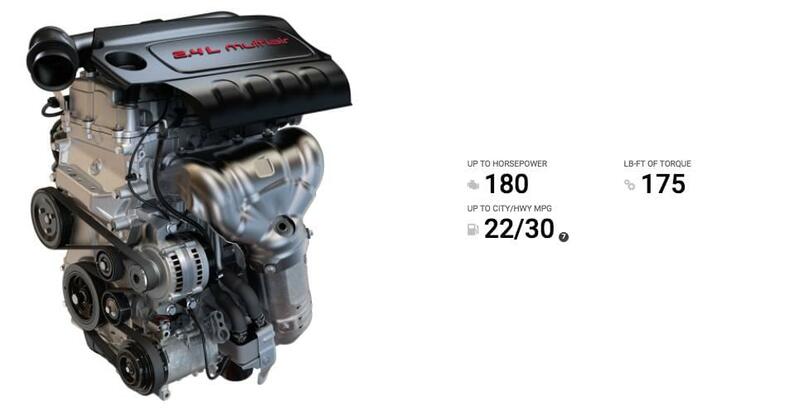 The 2.4L Tigershark engine features MultiAir technology that offers outstanding power and torque and reduced emissions. It’s standard on Limited and Trailhawk models and is paired with the available nine-speed automatic transmission. Jeep has been taken the technology of their vehicles to a whole new level in their partnership with Uconnect. Now you can access some of today’s smartest communication technologies with just a touch of your finger or a simple voice command. Uconnect systems allow the driver to stay focused on the road while using a full spectrum of available Uconnect services and features. Ask for directions, play your favorite music and more. Similarly, thanks to Integrated Voice Command with Bluetooth, you can send and receive hands-free texts while driving. Connect to your devices with Bluetooth to access all your phone capabilities and take advantage of available SiriusXM Satellite Radio, which gives you access to a number of commercial-free music, entertainment, news and sports channels. Every Renegade 4×4 is equipped with the available, Class-Exlusive Selec-Terrain dial. The system allows the driver to tune traction settings according to road conditions. The Auto, Snow, Sand and Mud settings are specifically tailored to ensure optimum traction and efficient operation. As mentioned before, the Trailhawk model gets an additional Rock setting for serious off-road maneuvers. Keep in mind the raised ride height that is offered on the Renegade, which has enhanced ground clearance along with forged skid plates to protect your vehicle’s underbody elements. Furthermore, Renegade has available red tow hooks that come standard on the Trailhawk with two front hooks and one rear. Lastly, the Jeep Renegade offers 17-inch aluminum wheels. The capable 17-inch off-road black aluminum wheels will take you around every corner and down every ridge with ease. 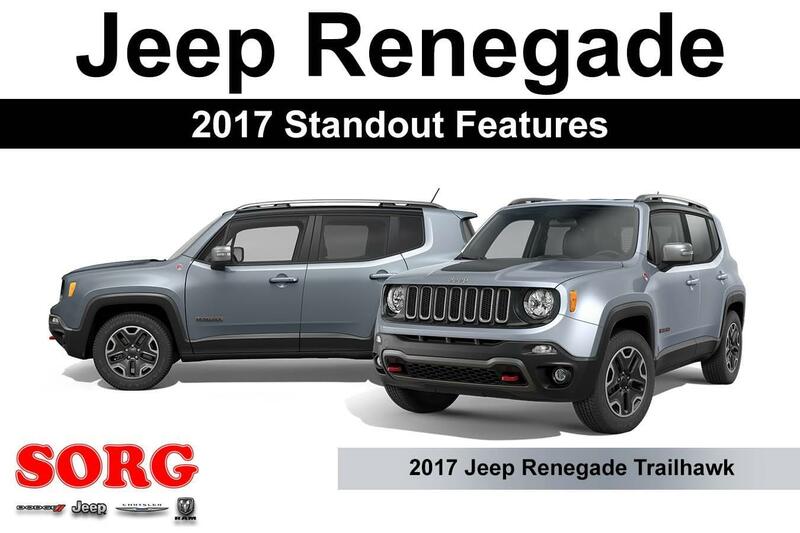 Right out the gate, you can accentuate the Renegade with dual-zone automatic temperature control, heated steering wheel, heated seats, and an auto-dimming rearview mirror. Combine that with the elegant interior on the Renegade which can feature available leather-trimmed seats that are soft and supple; or standard cloth seats with heavy duty mesh fabric to give every Renegade a distinctive look. To add to the uniqueness of the interior fabric, The Renegade features an available My Sky open air, dual-panel roof. You can retract the secure panel for a quick blast of sunshine with the available power My Sky roof or completely remove both roof panels for a real open-air experience. Once removed, the panels can be stored flat in the height-adjustable rear cargo area. Speaking of storage, the Renegade features an available height-adjustable rear cargo floor that stands ready to provide increased cargo space. The cargo floor can easily be moved up and down to make room for your items and provides a safe and secure spot to store the available My Sky panels. Simply place them in the included protected storage bag and they should fit perfectly into the rear cargo area. All-in-all, the 2017 Jeep Renegade certainly packs a lot of unique features. It’s got a one of a kind exterior that is accented with a custom interior feel. The drive-ability is top notch and comes with some high-end performance. If you are in the market for a good starter vehicle, we would highly recommend the Jeep Renegade. Still not sure on a vehicle that would be a great fit for your needs? Don’t worry. We have an excellent staff of product specialists here at Sorg Dodge that are ready to assist you at any time. Contact us today for more information and let us take your car buying experience to the next level.